Description: The Ghost-Faced Bat (Mormoops megalophylla) fur that ranges from red-brown to dark brown. This bat is most distinctly recognized by it’s face, with sunken eyes and ridges that portrude. The total length of this bat is 10 mm and weight averages from 13-19 grams. About the Ghost-Faced Bat: This bat is found typically in caves and tunnels but also in buildings. They congregate in large colonies, up to 500,000 individuals, but they do space themselves out (as much as 15 cm apart from each other). 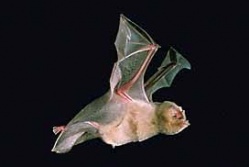 Lactating females (females with pups), separate themselves from males and females without pups and have a single baby bat.